While a lot of pests and their takeovers of your home are seemingly out of your control as a homeowner, there are a variety of measures you can take to control pests on your own. Most boil down to common sense and good house keeping. Remember, an ounce of prevention is worth a pound of cure. In order to avoid pest problems, don’t allow yourself to create an environment that is hospitable to them in the first place. Remember your mother always nagging you to clean up your room? Well, she had a good point! Most pests seek refuge in places that are warm and provides sustenance to support them and their offspring. Avoid clutter that can turn into nesting material and breeding grounds for rodents, insects and mites. Designated eating areas keep crumbs from accumulating around your house and inviting pests to roam free as if at a smorgasbord. 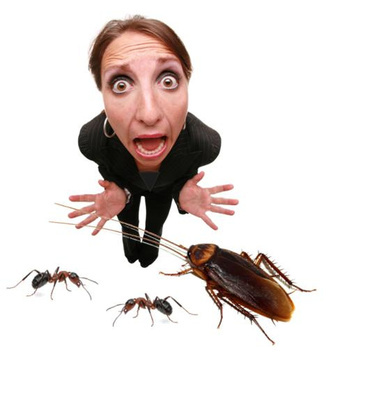 Most infestations occur because it is so simple to gain access to your home. An effective tip is to seal up small holes, cracks, and drafty areas. This will keep rodents, birds, and insects from seeking refuge in your home, especially during cooler months. Don’t forget to repair window screens to prevent mosquitoes and other insects from gaining easy access. and other remedies are available.Doing it yourself may save you a dime. However, does exposing yourself, your love ones and your pets to harmful chemicals and products worth it. If in doubt, consult a professional pest control management company to prescribe a solution to oust any pesky critters that have made your home theirs. This guest post was written By Karl the Bugman, EnviroCare Pest Solutions, Columbus Ohio 614-586-BUGS (2847). Please feel free to check http://www.MyEnviroCare.com for more answers to your bug questions. of the body) or its droppings and urine. and see if that works, or do you contact Manchester Pest Control? sanctions them to do so. results. You take a rest and we’ll do it ourselves! Pest Control For Pharaoh Ants. What you need to know about the Pharaoh ant. The Pharaoh ant is the smallest of all the ants found in the UK, and the most difficult to control. The Pharaoh ants commonly infestbuildings that are occupied by humans. These ants usually live in drains and sewerage systems before entering the home in search of warmth and food. Pharaoh ants nests are found only in buildings inhabited by humans and they are well adapted to living alongside humans. This ant is known to carry a number of pathogenic organisms and is therefore considered a public health concern that needs to be treated by a professional pest control company. These tiny insects, besides carrying pathogenic organisms, are also biting insects and their bites can produce skin irritations and allergic reactions in some individuals. Why Pharaoh ants are so difficult to control. What makes Pharaoh ants so difficult to control is their budding habit. This refers to their habit of splitting up the colony into smaller colonies each with its own queen ant. Each colony will then go its own way and find somewhere else to build their nests. When people try and treat their Pharaoh ant problem with DIY products, it most often results in merely alarming the ant colony of a threat, which consequently leads to the colony budding and multiplying at an even faster rate than before. This will not only make the infestation worse, it will also make the task of eliminating the Pharaoh ants a lot harder for the pest control company when they are called in. Calling in a professional pest control company. When Pharaoh ant invade your home, it is very important to contact a professional pest control company such as Protec Pest Control Manchester to deal with the problem in a timeous manner. When dealing with ant infestations, it is all important to eliminate the whole colony along with the queen ant. Protec Pest Control Manchester can eliminate your ant infestation in a way in which the ants are guaranteed not to return. They provide this service to residents of Manchester, Warrington, Stockport and Cheshire. Protec Pest Control Manchester will send in qualified technicians to deal with your ant infestation. The first step is always to identify the type of ant that is infesting the home so that the technicians know exactly how to deal with the problem. The different types of ants have to be dealt with differently and with different products, and this is where the expertise of the professional ant exterminators proves priceless. Protec Pest Control Manchester will use a two-step technique to exterminate the ants once and for all. Once the technicians have found the nests, they will spread a non-toxic pesticide close to the ants nests which will be carried back to the nest by the worker ants and eaten by the general population killing as many of the ants as possible. The second step is used to eliminate the entire colony; the technicians will drench the nests with an organic pesticide killing off any ants that survived the first step. Calling in a professional pest control company such as Protec Pest Control Manchester is crucial to controlling your ant problem. The trained professionals will be able to find the nests and deal with the ant colonies in a much more effective way than trying to treat the problem with DIY products.They will also be able to give you valuable advice and a plan to help you safeguard your house against further infestations. Good post, Jen. Hopefully you have found non-toxic pest control tips here that are effective in ridding your home of unwanted pests. I was facing the pest problem for the last 3 weeks. I have gone through this article and it helped me a lot. Thank you so much for your advice. Hey I well agree. Pest control and abatement should be left to the licensed professionals. Most wait till the problem gets out of hand before they will call. Better off having a regularly scheduled service to handle it. Keeping clean may be hard for some people but it is definitely worth it in the long run! .-= Megan@How to Lose Weight´s last blog ..How to Lose Weight Without Exercise =-. I agree that maintaining a clean home is probably the most important thing you can do to keep pests at bay. If you need to use a spray I always try to use a natural spray that is not harmful. Have had good results with the Best Yet products. These are excellent tips on Pest Invasion Prevention. We tend to find the common cause of infestation is leftover food. Some chemicals are extremely hazardous and the proper precautions need to be taken. Great tips!! I have been battling ants in my home for 3 months now. I do not want to spray harsh chemicals around since my step-son has asthma. Hopefully these tactics will take care of my problem. .-= Tracy@medifast1.com´s last blog ..Medifast Diet =-. I agree with may of the points you mentioned. The most important practice is Integrated Pest Management to ensure a pest free home.